NEBI SALEH, West Bank -- The curly haired Palestinian teenager is seen walking up to two Israeli soldiers standing near the entrance of her house, and she can be heard telling them to leave. She then pushes and kicks both soldiers who casually fend off the blows. Then she slaps one soldier hard in the face. Now, the 16-year-old girl from the village of Nebi Saleh is being celebrated by Palestinians as a hero and symbol of a new generation after confronting the two soldiers in a melee caught on a video that has been widely watched. U.S. warns allies Trump will take Jerusalem U.N. votes "personally"
In Israel, the soldiers' decision not to react to the seeming provocation by Ahed Tamimi has stirred a debate about deterrence and drawn allegations that the army was humiliated. Three days after the Friday confrontation, amid an uproar in Israel, Tamimi was arrested from her home in a pre-dawn raid and now faces charges of attacking soldiers. She was led in leg shackles to an Israeli military courtroom where a judge reserved a decision on whether to keep her without bail. He ordered her held for five more days, a decision that was appealed by her defense lawyer. "Stay strong, stay strong," her father Bassem, a veteran activist, shouted from the spectators' section. Haley says Trump takes U.N. Jerusalem vote "personally"
Earlier this month, President Donald Trump recognized Jerusalem as Israel's capital, setting off widespread protests by Palestinians who seek the city's Israeli-annexed eastern sector as a capital. Mr. Trump has said his statement did not define the boundaries of Israeli sovereignty in Jerusalem, but his move was seen by Palestinians as a sign of pro-Israel bias. In response, Palestinian President Mahmoud Abbas has said the U.S. can no longer be a Mideast mediator. Nebi Saleh is a village of about 600 people, most of them members of Tamimi's extended family. For eight years, villagers along with Israeli and foreign activists have protested weekly against Israeli policies in the West Bank. The Israeli military said Friday's protest turned violent, with about 200 Palestinians throwing stones at soldiers. Several people entered a local house, with the consent of the owners, and continued to throw stones, the army said. Soldiers entered the house, removed the stone-throwers and stayed at the entrance to prevent others from entering, it said. At that point, several Palestinians emerged from the house and began to "violently provoke the soldiers," the army said. Bassem Tamimi said that minutes earlier, soldiers had fired a rubber bullet from close range at 15-year-old Mohammed Tamimi, a cousin of Ahed and a frequent guest in the Tamimi home. Rubber-coated bullets are commonly used to disperse crowds. While considered nonlethal, they nonetheless can be dangerous. The teen remained in intensive care Wednesday after surgeons removed the bullet that had entered from his mouth and lodged in his brain, said officials at Ramallah's Istishari Hospital. The patient was alert after extensive surgery and would likely recover, they said. Bassem Tamimi said his daughter was upset about the shooting when she approached the soldiers. The army confirmed using rubber bullets to disperse what it called a violent demonstration but said it had no information on the boy who was shot. The video shows Ahed Tamimi and a young woman walking toward the two soldiers. Tamimi tells the soldiers to leave. She pushes and kicks them, and then slaps one of them. The young woman films the scene on her mobile phone. An older woman joins, at one point stepping between Ahed and the soldiers, but then also tries to push back the soldiers who don't respond. In an interview Wednesday, Bassem Tamimi praised his daughter as courageous, scoffing at criticism that she was an attention-seeking provocateur. "We hope that this generation will be stronger than us, and can take the flag from us with more power ... and more serious resistance to end the occupation," said Tamimi, 50, who spent more than four years in nine different stints in Israeli jails for anti-occupation protests. On social media, Palestinians celebrated Ahed as a hero in widely distributed cartoons. In one, she is shown in a Joan of Arc-like pose, raising a Palestinian flag, framed by her easily recognizable mane of blonde curls. 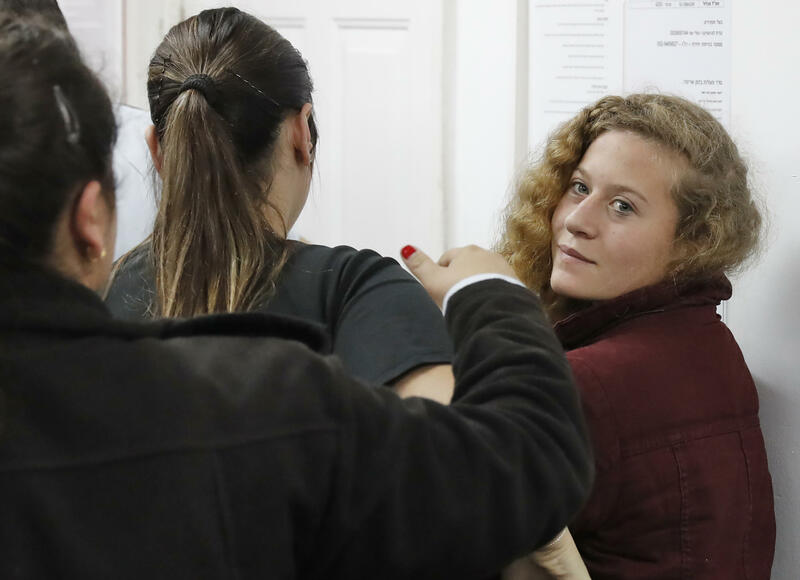 Ahed has made headlines in the past, including in 2015 when she bit the hand of a masked Israeli soldier who was holding her now 14-year-old brother Mohammed in a chokehold during an attempted arrest. A video of the incident that was widely watched, earning her an invitation to meet with the Turkish president. In Israel, the military said the company commander involved in Friday's incident "acted in a professional and restrained manner." Others were sharply critical of the soldiers. "When I watched that, I felt humiliated, I felt crushed," said Miri Regev, an Israeli Cabinet minister and former military spokeswoman. She called the incident "damaging to the honor of the military and the state of Israel." Palestinians and international rights groups have longed alleged that Israeli troops frequently use excessive force against Palestinians. "In the case of the girls, we should exact a price at some other opportunity, in the dark, without witnesses and cameras," he wrote. Others said the soldiers were placed in a difficult situation since a video showing them hitting or arresting a teen-age girl could potentially have invited more international criticism. The detention of Tamimi also highlighted the issue of arrests of Palestinian minors. Defense for Children International-Palestine, a local group, said 331 Palestinians under the age of 18 were held in military detention as of May, according to the most recent statistics released by Israeli authorities. It said that in 2016, an average of 375 minors were in detention each month. The Israeli military was unable to provide data on the number of minors it is holding. It said, however, that "unfortunately, in recent years, many minors, sometimes very young, have been involved in violent incidents, incitement and even terrorism. In such cases, there is no choice but to take steps, including arrest, interrogation and prosecution." It said the military does everything possible to "ensure that the rights of the minors are respected."